LG NeON™ 2 Black is the brand new all-black module made with n-type cells. Due to Cello Technology, it features aesthetic appearance as well as its high power output. 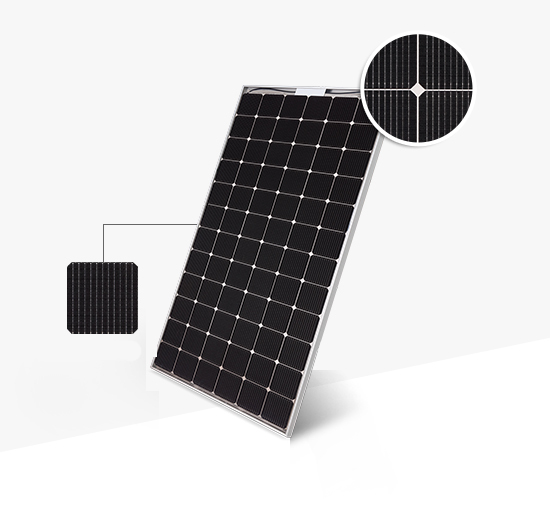 The LG NeON™ 2 Black solar module featuring a black anodized frame and black back sheet has been designed with improved aesthetics. Thanks to the use of thinner wires, it now looks totally black even from a distance. Its elegant design will fit in easily with the appearance of your home and may increase its value. With reinforced frame design, LG NeON™ 2 Black can endure a front load up to 6000 Pa and a rear load up to 5400 Pa. Based on the improved rigidity, LG has extended the product warranty for additional 2 years. LG’s new module, NeON™ 2 Black, adopts CELLO technology. CELLO technology replaces 3 busbars with 12 thin wires to enhance power output and reliability. NeON™ 2 Black demonstrates LG’s efforts to increase customer value beyond effi ciency. It features enhanced warranty, durability, performance under real environmental conditions, and aesthetic design suitable for roofs. LG NeON™ 2 Black has an enhanced performance warranty. The annual degradation has fallen from -0.7%/year to -0.6%/year. Even after 25 years, the cell guarantees 2.4% more output than the previous NeON™ modules. The full LG range now also comes with 25 Year standard product warranty. LG NeON™ 2 Black now performs better on sunny days thanks to its improved temperature coefficient. Compared with previous models, the LG NeON™ 2 Black has been designed to signifi cantly enhance its output efficiency making it efficient even in limited space. With its newly reinforced frame design, LG has extended the warranty of the NeON™ 2 Black for an additional 2 years. Additionally, LG NeON™ 2 Black can endure a front load up to 6000 Pa, and a rear load up to 5400 Pa.